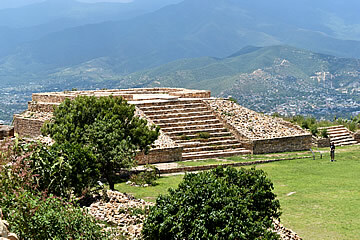 Atzompa on a high hilltop is a sister site to Monte Alban, on a good day the views are fabulous. 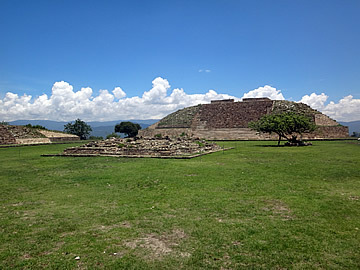 A small but interesting Zapotec site with a huge ball court. 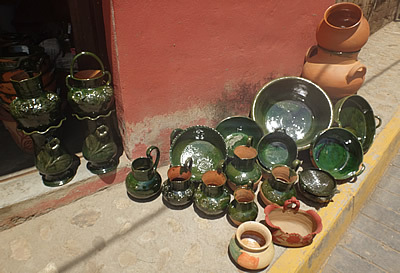 Santa Maria Atzompa is famous for its green-glazed pottery. Around 500 AD the Zapotec society began to change from priest-dominated to military-dominated. 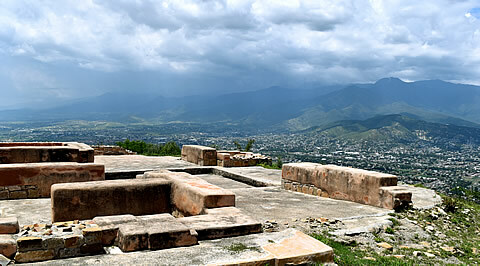 Later the Zapotec region began to fragment, there were perhaps civil wars. 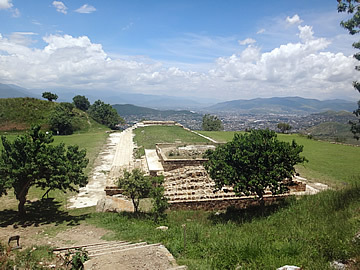 It had been thought that the Mixtec rose as the Zapotec declined (the Mixtec existed alongside the Zapotec previously) but it may be that they shared rule in the latter days of the great Zapotec capital of Monte Alban. 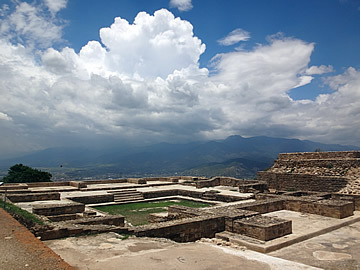 Atzompa stands on a hill across the valley from Monte Alban on its own hilltop - both strategically defensive sites. 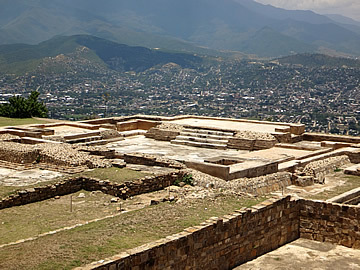 Occupied from around 650 AD to 900 AD it has four excavated terraces.1 The easternmost terrace (Terrace 4) includes a large house, the East House, with attached service building, and a ball court (3). 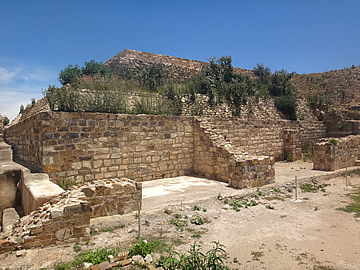 The eastern end of the site: Building 16 - a stepped platform, top left, the East House in the centre, its service buildings in the right behind Ball Court 3 in the foreground. On the eastern edge, Building 16. 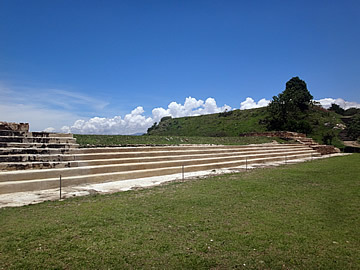 Atzompa is often talked about in terms of being a satellite or suburb of Monte Alban - perhaps as the population of Monte Alban grew they needed a bigger ball court and placed it in the new settlement on the nearby hill, because Atzompa has the largest ball court in the area. 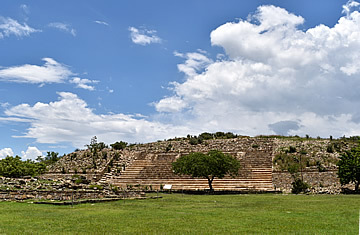 The ball courts here, as at Monte Alban, have niches, perhaps to hold the statue of a deity or offerings. The patio is sunk from view and none of the buildings on the platforms have survived. The terrace has a sloped base. The East House is described by a site information board as a residence for upper class families - whether this means that more than one family lived here I don't know, but it is certainly large enough to house a good number of people. Four high quality platforms surround a sunken square patio. Rooms would have been built on the platforms which seem to have been of a vague talud tablero style with sloping walls and vertical panels. 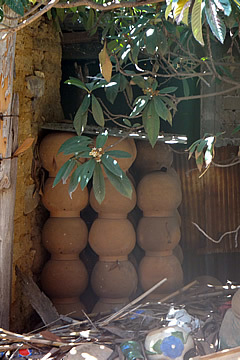 The houses were built with stone blocks and adobe finished with a thick layer of stucco. Alongside the house was a separate service building with its own complex of rooms and Ball Court 3, the smallest of the ball courts so far discovered at Atzompa. However, the largest is very close on Terrace 3, alongside a quarry. At 45m long and 22m wide Ball Court 1 is the biggest here, larger than any other in the region. All of the ball courts are I-shaped with perpendicular areas at the ends of the playing area. Niche in the corner of Ball Court 1. The ball court has niches in the north east and south west corners. How and why the ball game was played is not completely understood, except that the heavy rubber ball could be hit with any part of the body except hands or feet and that it may have had a ritual purpose. It's postulated that the losers were sacrificed - or that the winners were sacrificed, it perhaps being regarded as an honour. The size of the ball courts was certainly not standardised - some are vast, others are miniscule. 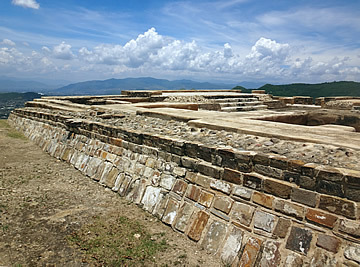 North and west of Ball Court 1 is Terrace 2 with plazas B and C. Plaza B, the larger, lies north of C.
The Sentry Platform between Plazas B and C.
Building 6 on the north side of Plaza B. 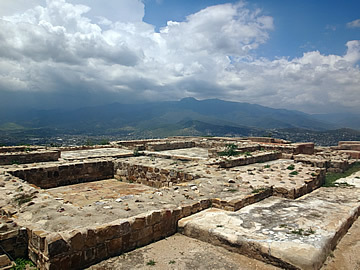 A tomb with three chambers was found in Building 6 on the north side of Plaza B. 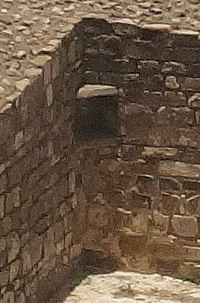 In a lower chamber a skeleton was found alongside a vividly red painted ceramic head.2 Murals on the walls featured a jaguar paw print and I-shaped ball court. 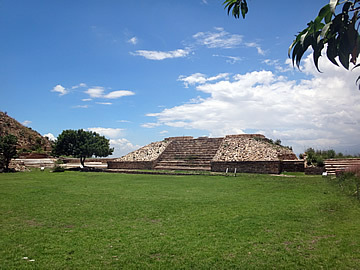 On the north west of Plaza B is the high status House of the Altars. On the right is Building 6 on the north side of Plaza B. Remains of decorative detail on the edge of the patio, House of the Altars. 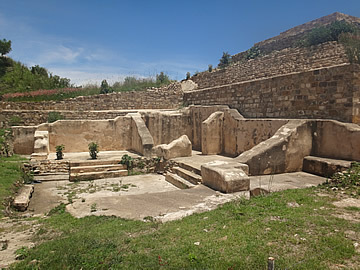 Terrace 1 and the ceremonial Plaza A lie west of Terrace 2. 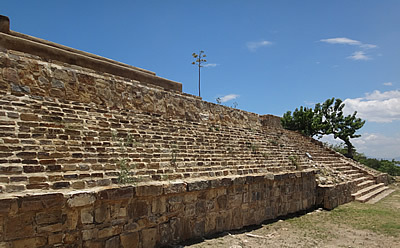 The lower parts of the terraces on all four sides are in a good state. 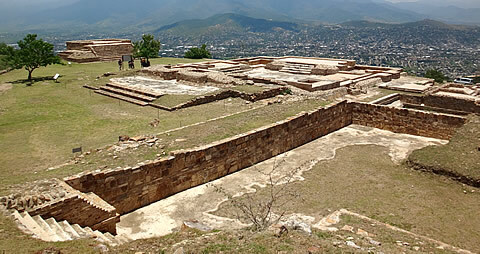 Plaza A, looking south west. 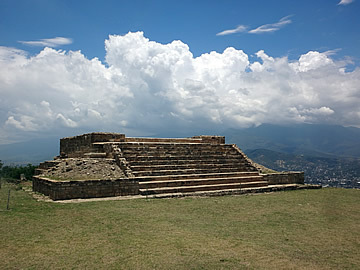 In the centre are the remains of the ritual temple. 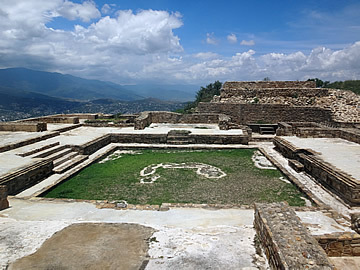 Plaza A is on the highest point of Atzompa and consists of a large square patio 50m x 50m. In the centre was a temple, 3m x 3m. 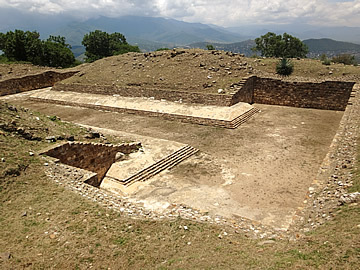 with a cross-shaped structure in the center which was probably an unfinished tomb. Ritual ceremonies would have been performed in the plaza including the worship of deities and making offerings and sacrifices. Ceremonies are still performed here today, adjusted to reflect the changing religious practices of the inhabitants of the area. 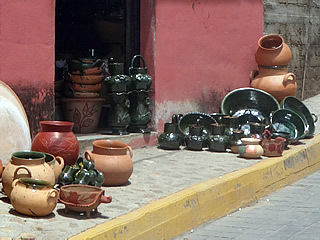 Our guide, Alejandro, wanted to visit a local pottery shop as he wanted some pots for his garden. 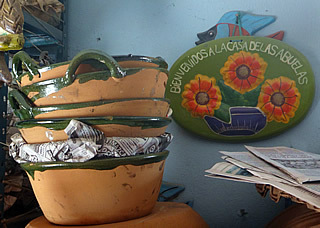 A bonus because Santa Maria Atzompa is the village where the green-glazed pottery is made and I was keen to see more. 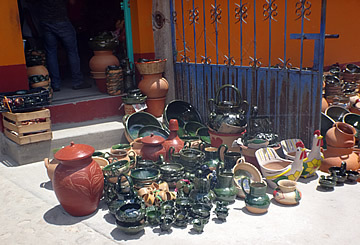 We had visited San Bartolo Coyotopec where the black pottery is made and there is also a village where brown-glazed pottery is made.